An inexplicable contradiction exists in our time: while our churches are emptying, ever more people are searching for the silence and timelessness of the monasteries, as well as self-awareness on the great pilgrimages. How can this great fascination be explained? For many years Heinz Nußbaumer has visited the monasteries of Mount Athos - at first out of curiosity and to flee the state of permanent accessibility. Late it was a longing for a "counter world", whose radicalness held ready a unique treasure trove of life experiences. A treasure trove for people who have to prove themselves in the midst of their lives too. His book gives one courage to set off on the ancient path of monastic spirituality. The book tells of the strength of happiness that comes from silence. It shows paths to a meaning of life that doesn't grow from wellness and fitness strategies, but rather from the ability to listen deep inside our hearts, to look inward again - and to once more find the highest measure of peace for the soul in the here and now. 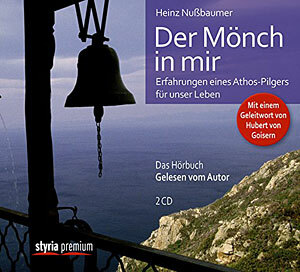 On 8th September the bestseller Der Mönch in mir: Erfahrungen eines Athos-Pilgers für unser Leben (The Monk in Me: Experiences for our life from an Athos pilgrim) will be published for the first time as a German audio book, read by the author, Heinz Nußbaumer. His long-time friend Hubert von Goisern collaborated not just as producer during the recordings at his Salzburg studio, but also wrote the foreword to the release.